Through a somewhat odd set of circumstances and despite being pretty busy I havent had anything I cut on TV since April 2011. That is until now, Tuesday sees the screening of this sports doc I did for Independent pictures. It was directed by Ronan O’Donoghue and I’m quite proud of it. 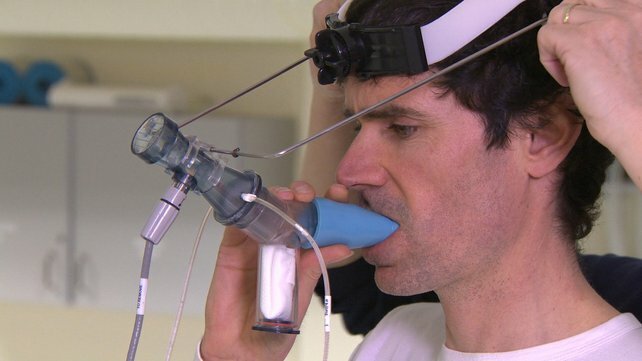 I trust you’ll all be watching..
Sports science documentary Faster, Higher, Stronger sees journalist Ian O’Riordan examine how athletes are using science and technology to enhance their performance, asking whether or not we can ever again truly believe in the purity of sport. The Olympic Games are meant to represent all that’s good and pure about sport – heroic acts of courage, fair play, and being all that you can be. But ever since Ben Johnson failed a drug test in 1988, the biggest sporting show on earth has been dogged by scandal and suspicion. And now, with the curtain about to rise on London 2012, Ian O’Riordan of the Irish Times looks at the growing impact science and technology has on sport – legal and illegal – and wonders if sport can ever regain our trust. A lifelong sports fanatic, Ian O’Riordan’s world changed when Ben Johnson was caught at the 1988 Games. Ever since, as a competitive distance runner, through his career as a sports journalist, he’s been trying to answer the question that was raised that September morning in 1988 – is any of this real? In Faster, Higher, Stronger, O’Riordan looks at a range of performance enhancement techniques, both legal and illegal, to discover if science has become more important than good old-fashioned hard graft and talent. He also spends time with members of the Irish Olympic team for 2012, to get inside the mind of the people that go to extraordinary lengths to gain a competitive edge. Ian meets race-walker Colin Griffin, who’s living in a bespoke altitude house in Limerick, fitted out to mimic the air density of Kilimanjaro. While Rob Heffernan, another walker, has to make do with a tent over his bed to get the same effect. Ian asks if this method of manipulating the body’s make-up is really fair, using the example of a banned swimsuit as an instance technology was outlawed. He reconnects with Martin Fagan and Geraldine Hendricken, two Irish athletes who received bans for failed drugs tests. He looks at the world of sports supplements, asking if these are really just legal performance enhancers. The next big threat to fair play in sport is genetic doping. Travelling to the world centre for genetic doping, via a herd of Supercows in Laois, Ian explores whether messing with the DNA is a real problem or just science fiction. He meets the main players in the war on doping for London 2012 to discover how sport is putting up a fight against the cheats. And in attempt to get inside the mind of a cheat, Ian undertakes to go on a course of performance enhancing drugs. In doing so, he discovers that the results might be more dramatic than he could ever have imagined. Faster, Higher, Stronger is a comprehensive exploration of performance enhancement that combines an in-depth look at the science of sport with a personal search for the truth about fair play. Watch Faster, Higher, Stronger on RTÉ One on Tuesday 17 July at 9.35pm.